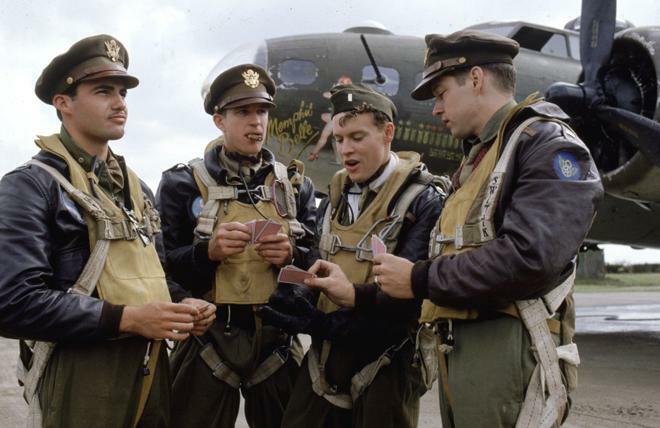 'Memphis Belle' re-creates the actual events of the team of men who flew dangerous missions over Nazi-occupied Europe during World War II. They flew one of America's giant B-17 flying fortresses known as Memphis Belle. Featuring a brilliant cast, 'Memphis Belle' stars Matthew Modine, Eric Stoltz, Tate Donovan, D.B. Sweeney, David Strathairn, Billy Zane, Sean Astin, Harry Connick, Jr. and John Lithgow. Directed by Michael Caton-Jones. Hollywood war films usually tend to lean toward one of two directions: gritty or sentimental. One side emphasizes the visceral horrors of battle, while the other places a larger focus on inspirational pangs of brotherhood and triumph. With 'Memphis Belle,' director Michael Caton-Jones veers much more toward that latter category, offering a decidedly old fashioned but still engaging cinematic approach. With a likeable ensemble and an impressive aerial battle sequence, the movie creates a thrilling and occasionally emotional tale of friendship and bravery -- overcoming a few simplistic storytelling elements to pull off a slightly bumpy, but safe landing. Based loosely on the 1944 documentary, 'The Memphis Belle: A Story of a Flying Fortress' (also included on the Blu-ray), the film chronicles a fictionalized account of the aircraft's last assignment during WWII. After flying twenty four successful missions without incident, the B-17 bomber is set to embark on its final run, after which its crew can return home to the United States. Charged with a risky daylight raid on a German aircraft factory, the ten man team must overcome dangerous enemy attacks and interpersonal conflicts if they want to stay alive. But even if they succeed in their mission, will the Memphis Belle really be able to make it back again in one piece? When we first meet the B-17's intrepid crew, the camera is focused closely on the group playing a game of football. Innocent and seemingly without a care in the world, the gang looks just like any other average assortment of young men. But then the camera pulls back, and it suddenly becomes clear that we're actually on a US Army Air Force base in the middle of WWII. They may play catch like any other ordinary group of average American youths, but their dire situation really couldn't be further from carefree. This deliberately contrasting image helps to establish one of the movie's central dramatic themes -- that despite their weighty responsibilities and dangerous missions, at their core, these are really just kids being asked to risk their lives for their country. To this end, the movie does a good job of establishing the characters before their mission, dedicating a solid chunk of time to some pre-battle shenanigans. This includes a celebratory dance, mission briefing, and some downtime during a flight delay, giving the group time to joke around and bicker with one another. These early sequences start to give us a sense for the crew members as individuals and how they all fit together as a team, making it easier to care about the gang once the action starts later in the runtime. And while not every character is fully realized or particularly original, they all feel relatively distinct from one another, and the cast does a very solid job of injecting some personality into their roles. Starring the likes of Matthew Modine, Eric Stoltz, Sean Astin, Tate Donovan, Reed Diamond, John Lithgow, David Strathairn, and Billy Zane, the film is home to a veritable ensemble of underappreciated actors. Well, maybe not Billy Zane… but the rest surely qualify. And as a very special added bonus, we even get an impromptu musical performance featuring the irresistibly smooth vocal stylings of one Harry Connick Jr. -- and come on, how many other war flicks can boast such a captivating feat? As a whole, the gang all works well together and they make for a convincing band of brothers, fully selling their deep but occasionally contentious bond. Of course, the ensemble wouldn't be complete without one more very important member: the Memphis Belle itself. The central aircraft makes for an invaluable on-screen visual, and director Michael Caton-Jones creates a very convincing sense of place, strapping the audience right there in the plane along with the crew. Once the plot's harrowing mission finally begins, we're treated to an extended aerial battle sequence, and this set piece proves to be very impressive and thrilling. Tension is built up expertly as we gain a feeling of claustrophobia on the bomber while it makes its initial approach toward enemy air space. 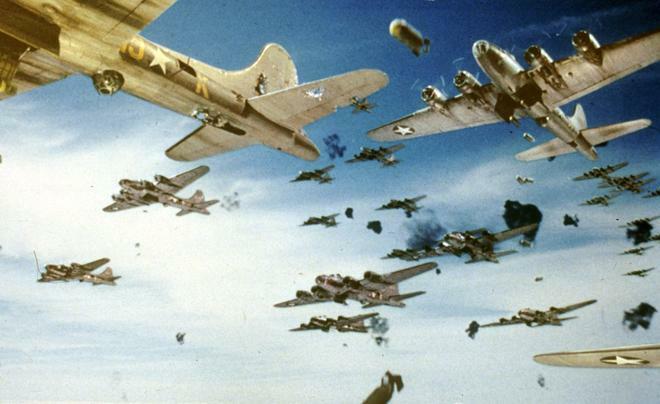 And when German planes do start their attack, the resulting skirmish is exciting and cinematic, providing a great mixture of practical aerial photography and special effects composites. Likewise, Caton-Jones handles the mission's various setbacks and dramatic turns well, and while the eventual outcome is never really in doubt, the director still manages to create a palpable undercurrent of suspense. With that said, some aspects of the script and direction soar higher than others, and there are a few issues here and there. Early scenes have a fairly clunky quality to them and it sometimes feels like there might be some pieces missing. Some of the characterizations are also pretty clichéd and a few attempts at drama lack subtlety (usually involving the crew's fears and stress), making them fall flat. The film's old fashioned sensibilities and overtly inspiring tone might not work for all audiences either, resulting in a rather simplistic depiction of war. A few sentimental stretches are also hit and miss, and though an emotional sequence involving letters written by family members who have lost loved ones in action works well enough on its own, the scene feels a bit out of place within the larger runtime. It's unlikely that 'Memphis Belle' will ever make a list of all-time great Hollywood war films, but this mostly forgotten movie is a very solid effort. While certain elements of the script and direction are simplistic and a little too old fashioned for their own good, this is still a handsomely photographed and frequently gripping film. Held aloft by an enjoyable cast and some exciting aerial footage, the film successfully completes its central mission -- offering audiences an engaging story marked by inspiring brotherhood and heroism. Warner Bros. brings 'Memphis Belle' to Blu-ray on a single BD-25 disc that comes housed in a keepcase. After some logos and warnings, the disc transitions to a traditional menu screen. The movie is provided with a 1080p/AVC MPEG-4 transfer in the 1.85:1 aspect ratio. Nicely detailed and beautifully filmic, this is a stellar video presentation that avoids the usual outdated qualities that many catalog titles fall victim to. The source print is in great shape with a moderate layer of natural grain visible throughout. With that said, some archive footage is used every now and then, and this material understandably shows clear signs of age. Likewise, a few special effects shots tend to standout and look a little rougher than the rest of the picture. Thankfully, the majority of the image is very impressive, offering pleasing fine detail in the costumes, locations, and sets, convincingly bringing the Memphis Belle to life. The central bombing run and aerial battle scene are especially striking, and the visuals are rendered with great clarity and dimension. The palette mostly sticks to browns, greens, and yellows, helping to evoke the bygone 40s era, but all of the colors still carry a rich and vivid quality. Contrast is well balanced with even whites and solid shadow detail, though blacks are just a hair elevated in nighttime scenes. 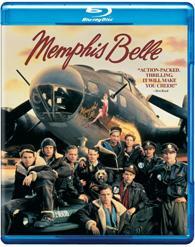 'Memphis Belle' looks gorgeous on Blu-ray, proving that catalog titles can still be done right. Completely free from artifacts or any overzealous digital processing, this is a respectful and impressive image. The film is presented with an English DTS-HD MA 5.1 mix and a Spanish Dolby Digital 1.0 mix, along with English SDH, French and Spanish subtitles. Though not as robust as modern releases, this is a strong surround sound mix that offers a good sense of immersion. Speech is clear and well prioritized throughout but it does sound just a tad thin. The overall soundscape is effective, though certain scenes have a comparatively small sense of scope and the mix isn't as layered as contemporary releases. Still, the track offers a solid sense of ambiance, spreading appropriate effects (applause during a party, clatter in the air hanger, etc.) throughout the film's different locations. The central air mission offers the most impressive design work, and this sequence proves to be very enveloping. Planes move about the room, swooping form the left and right, and from the front to back with smooth imaging and directionality. Spinning propellers, gun fire, and explosions all come through with a notable low frequency kick, but bass activity isn't quite as commanding as it is in modern war films. The movie's soaring musical score also features pleasing range and separation, and balance between all of the elements is handled well. It's not as bombastic as some might expect for a war film, but the track provides a pleasing sense of atmosphere and the film's action set piece offers some potent design work. The Memphis Belle: A Story of a Flying Fortress (SD, 40 min) – Presented in standard definition with Dolby Digital 2.0 audio, this is the 1944 documentary directed by William Wyler that inspired the movie. 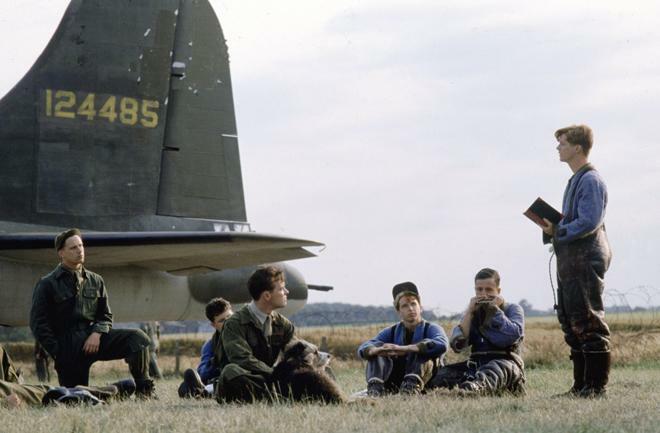 The old fashioned doc (complete with a commanding narrator) focuses on the real Memphis Belle and follows the crew through its mission briefing, take off, bomb run, and return home, offering some great real-life footage of the plane in action. This isn't the most in depth movie, but it's a really interesting piece and it complements the narrative film well. Theatrical Trailer (SD, 2 min) - The film's trailer is included in standard definition with Dolby Digital 2.0 sound. 'Memphis Belle' is an old fashioned but still engaging war drama. Despite a few simplistic and clunky elements, the film's visuals and cast are strong, resulting in a very solid effort. The video transfer is exceptional, providing an authentic and impressive image. Likewise, the audio mix is strong, giving audiences an immersive experience during the movie's central aerial sequence. We don't get many supplements, but the included 1944 documentary serves as a great companion piece to the feature. Armed with a worthy film and a great technical presentation, this is a catalog title done right. Recommended.